There's more in the FastDates.com Store! but you can at least get into their shirts! Order Securely online with PayPal. Note: XXL only available in White. so we will substitue Blue/Blk on White. Below Right: This hot design features Calendar Kitten Tamara Witmer on the Roland Sands / Kenny Roberts MotoGP 990cc 5-cylinder KR Tracker with the historic Queen Mary ocean liner in the background. 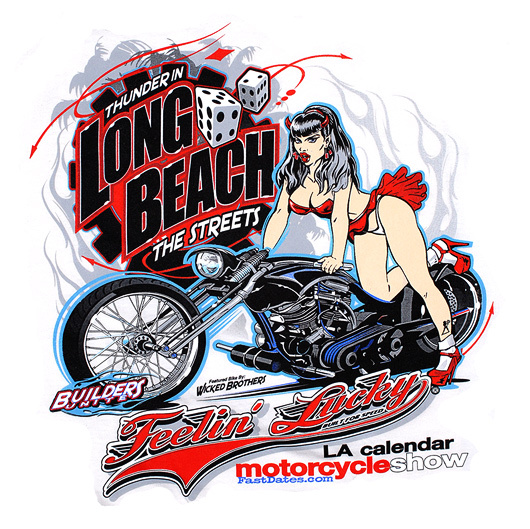 "LA Calendar Motorcycle Show" on bottom. Full graphic on back, pocket logo on front. Available on White Shirt in LG, XLG only. 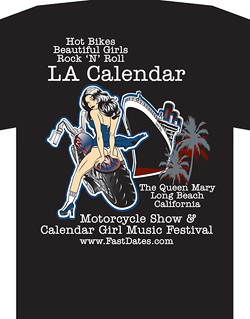 The 2010 LA Calendar Motorcycle Show shirt design features a cute raven haired Kitten straddling the back seat of a chopper next to the the Queen Mary, ready to take a ride! Matching smaller graphics on front chest. Available on Black or White T-Shirts. out of your selected color in the correct size. US Postal Mail Priority Air Shipping is added at $8 per shirt. For International Priority Air Mail we will Email you with a price quote for any additional postage that may be needed, which can then be paid on PayPal.com. If the International postage is too high, you can also ask for a refund of your purchase for the order. FastDates.com Calendar Kitten Stickers on Heavy Duty Die-Cut White Vinyl with peel and place adheasive backing. We didn't want no whimpy stickers on our bike that fade or blow off at the power car wash. These will make your day. for your bike, car, toolbox and refridgerator! Just $5 each, plus $3 S&H USA per design order. I Must Be Fast... I'm In Front of You! 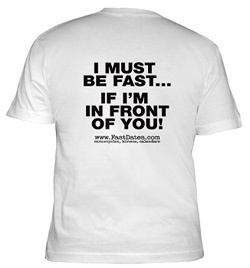 Here's some more exciting FastDates.com T-Shirt Designs and Products that are printed to order and shipped direct fron by our supplier CafePress. Including Alpinestars, Dainese, Garne, riding gear and much more! Please note: If we have the Shirt Design and Size you want, but are sold out of the Shirt Color you want - we reserve the right to substite the shirt color. Please describe fully the the Shirt Design, Size, Color (White or Black) you are ordering, and the Price and Quanity for each, plus $8.00 Postage & Handling per Order.